To keep up with the likes of T-Mobile, Verizon has unveiled a new data rollover plan, and is also revamping its current plans to include more data — but at higher prices. The highlight is its revamped My Verizon app, which the company is pushing as its “foundation” for future plans and features. The new data plans tout more data, more control, and more network — the S, M, L, XL, and XXL plans are all getting a 30-percent data bump, but also a price increase. Starting with the S plan, data will get bumped up from 1GB to 2GB, with the price increasing by $5 to $35 a month. The M plan, which currently includes 3GB of data, will now go up to 4GB, with the price increasing by $5 to $50 a month. The L plan, also known as the middle child, will see a data increase from 6GB to 8GB, with the price going up by $10 to $70 a month. The XL plan will go from 12GB to 16GB of data, with the price rising from $80 to $90 a month. Finally, the XXL plan sees the biggest data increase, going from 18GB to 24GB, with the price increasing by $10 to $110 a month. 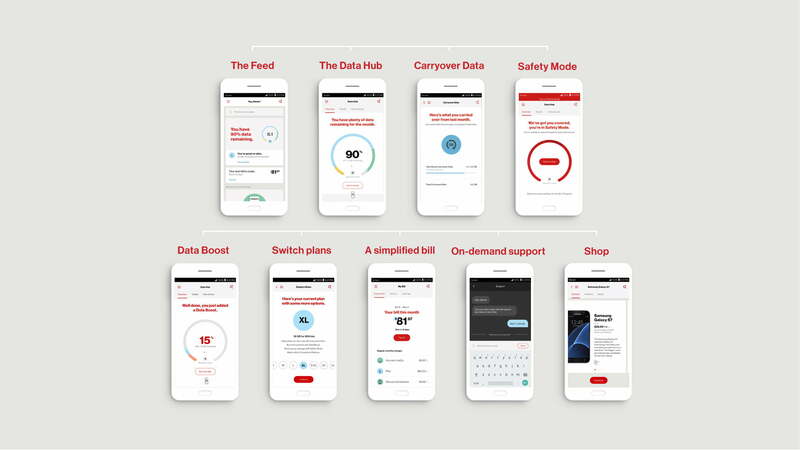 The new plans all come bundled with other features, which will all be available in the upgraded My Verizon app. The app has been redesigned “from the ground up,” and it features five core features. Once you open the app, you’ll notice the Feed, which tells you everything you need to know about your data. You can also swipe through to see personalized offers and content. The Data Hub shows you how much data is being used, who in your plan is using it, and more importantly, you’ll be able to change your plan at any time, and get more data immediately. Within the Data Hub, you’ll get a slew of new features such as Carryover Data and Safety Mode. Carryover Data lets you keep unused data for another month — it automatically carries over when the new month starts, so you can say goodbye to overage fees. Safety Mode lets you stay connected even if you have used up all your data, but your speeds will then be limited to 128 kilobits per second. It works on an account level, so all your devices will run at this speed if you turn it on. These two features will only be available on the XL and XXL plans, but you can add it to the S, M, and L plan for an additional $5. You’ll also find a feature called Data Boost, which lets you add 1GB of 4G LTE for $15, which also carries over to the next month. The app also lets you shop for Verizon-branded phones, and the carrier says you can browse, buy, and upgrade your devices straight from the app. There’s also on-demand support available in the app, where you can easily launch a message thread with a customer support representative. And finally, the app makes paying your bill simple and easy, allowing you to see what changed month-to-month in detail. People on the XL and XXL plans will also get unlimited talk, text, and data when in Mexico and Canada. You can stay on your current plan if you want, but of course you won’t get any of the new features. 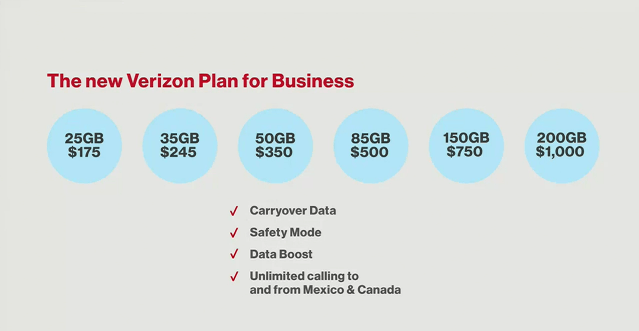 Verizon also announced a new plan for enterprise customers, which you can view in the handy chart below. The new features affect business plans as well, and the data-to-price ratio includes 25GB for $175, 25GB for $245, to 200GB for $1,000. The update with all these new features and the new data plans go live when the My Verizon app update rolls out on Thursday.